For 30 years, Farm Aid has been helping family farmers with a variety of problems. We take a look at the history of the organization and its continuing efforts. 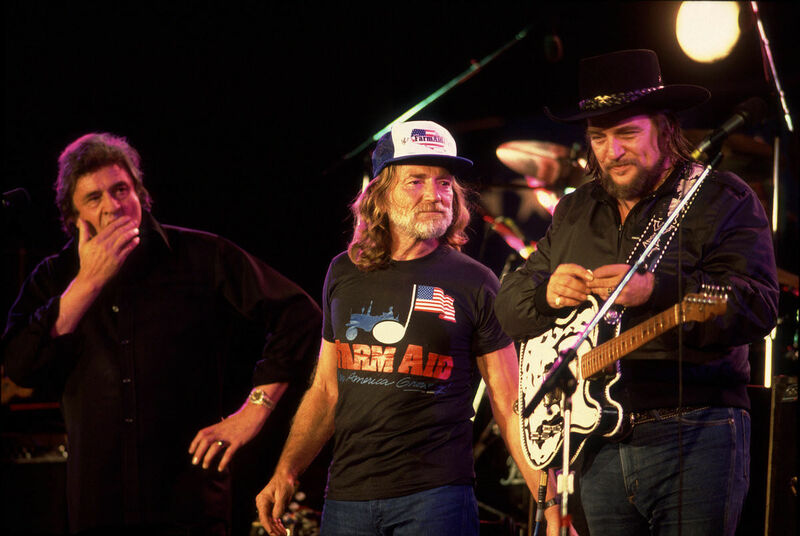 Johnny Cash, Willie Nelson, and Waylon Jennings on stage at the first Farm Aid concert in 1985. Photography Paul Natkin/Photo Reserve, Inc. The Farmers Home Administration, the lending arm of the United States Department of Agriculture during the 1980s, was aggressively collecting on loans they had just as aggressively encouraged small farmers to take a few years earlier, when land values were high. When the price of farmland bottomed out, the government foreclosed on farmers, ordering them off the land within 30 days or forcibly removing them. It was in this oppressive atmosphere that Willie Nelson came up with and idea for a fundraising concert for desperate family farmers. He joined forces with John Mellencamp and Neil Young to organize the event. “Farm Aid really was the organization that brought the people’s attention to the family farmer. It’s fortunate that these three extremely iconic artists were on board for family farms,” says Carolyn Mugar, who’s been Farm Aid’s executive director since the beginning and was a trade union organizer before stepping into the position. On Sept. 22, 1985, Nelson’s vision became a reality. The Farm Aid concert featured some of the greatest American musicians of the 20th century, from Johnny Cash to Bob Dylan to B.B. King, together with 80,000 fans at the University of Illinois Memorial Stadium. 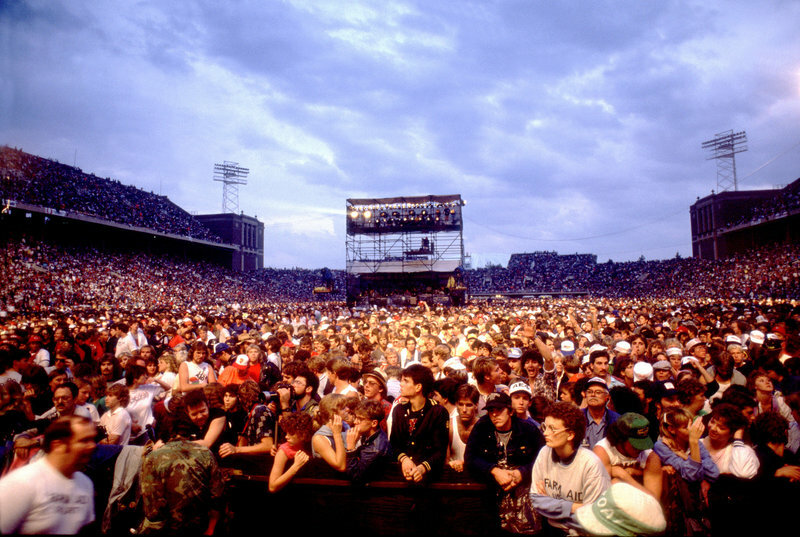 The 80,000-strong crowd at the original Farm Aid concert. Paul Natkin/Photo Reserve, Inc.
That year, Farm Aid raised about $7 million and, among other endeavors, provided funding to the Missouri Rural Crisis Center (MRCC), the nonprofit Allison helped start to advocate for family farmers. Farm Aid also helped fund the Farmers’ Legal Action Group (FLAG), a nonprofit law center that took on the federal government leading to the halt of 80,000 farm foreclosures. It boosted the morale of family farmers who had been beaten down by the system. Beyond the monetary aspect of the first Farm Aid concert there was a perhaps less tangible but arguably equally important facet of the event: It boosted the morale of family farmers who had been beaten down by the system. Allison recalls being on a train heading from Des Moines, Iowa, to the concert in Champaign, Illinois, and seeing fellow farmers lining the train’s route. “All along the railroad tracks, there would be farmers with flags, with their families, because they knew this was our best shot at turning things around,” he says. The concert also planted seeds in many young people who had never considered agriculture as a career and knew little about sustainable farming. Tim Ryan, a freshman in pre-law at the University of Illinois at the time, went to the first Farm Aid concert for the music, but once there he learned about the plight of farmers and about organic agriculture. The experience would stick with Ryan. He would eventually work for the Seeds of Change organic research farm in New Mexico, before returning to Illinois. He now sells his sustainably grown produce, flowers, and seeds in Springfield. Ryan’s been to seven Farm Aid concerts and plans to attend the 2015 event in Chicago. His younger sister, who also attended the first event, plans to meet him there for a family reunion of sorts. Thirty years on, Farm Aid continues to help family farmers, as does the MRCC and FLAG. The focus has shifted somewhat over the years and now includes the fight against corporate control of agriculture. Rhonda Perry, who with her husband, Allison, runs the MRCC, says following the farm crisis, corporations took control of “the agricultural land and the food system, including the market place.” The couple has led the protest against giant agribusinesses and confined farming methods in Missouri, with the help of Farm Aid. Perry and Allison raise livestock and grain on 850 acres in Howard County, Missouri, and also run Patchwork Family Farms, a cooperative of 15 independent hog farmers who raise sustainable meat. The two were also involved in bringing local, sustainable food to the Farm Aid concerts, beginning in 1998. While today it’s becoming more commonplace to see concert venues serving this type of food, it was fairly radical nearly a decade ago when they began. Perry says one of the reasons Farm Aid has remained important for family farmers is its close ties to grassroots organizations. Nelson, Young, and Mellencamp remain on Farm Aid’s board and were joined by Dave Matthews in 2001. All four will be playing, along with a long list of other artists, at the 2015 concert set for Sept. 19 at the FirstMerit Bank Pavilion at Northerly Island in Chicago. Over the course of its history, Farm Aid has raised about $48 million and has a four-star rating (the highest possible) from Charity Navigator for 2013, the latest year available. Mugar says Farm Aid isn’t going away anytime soon. “[Farm Aid’s founders] are junkyard dogs and don’t let go of the bone. We don’t have all the answers yet. There’s so much work to be done and so many people to be brought together,” she says. Allison agrees that the struggles of family farmers are far from over and that Farm Aid is still badly needed.